There’s more for sale at 1006 Chantilly Road in Bel Air than a $23 million, seven-bedroom mansion. 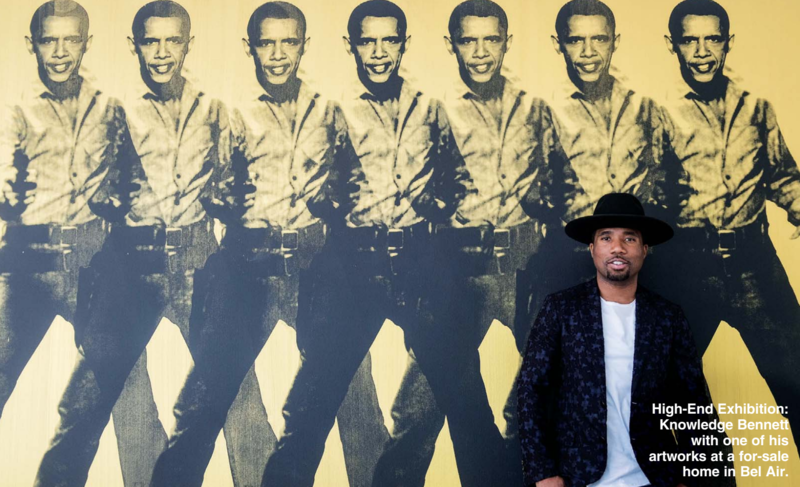 Also available for purchase are 16 art pieces adorning the walls, including one Andy Warhol-like painting depicting former President Barack Obama as a cowboy and another featuring Marilyn Monroe sporting a Tupac Shakur-style bandana. The Bel Air spec house is the latest venue for L.A. artist Knowledge Bennett to exhibit his work and pieces by other artists represented by his L.A. agency, Know Contemporary. Seeing an opportunity to ride a marketing opportunity that comes with bringing wealthy buyers through high-end homes, real estate agents and developers are increasingly striking up partnerships with artists and gallery owners as an alternative to hiring a traditional art-staging firm and paying an upfront fee. Art staging has become more important to agents and developers as they try to draw buyers to their properties – something that has grown tougher due to a huge number of listings available online. “You have to up your game to compete,” said interior designer James Magni, partner at Magni Kalman Design near Hancock Park. Meanwhile, artists are searching for new ways to get their artwork seen, especially by those with disposable income. While Magni’s work mainly involves custom designing home interiors for clients, he sometimes stages spec homes for developers. That involves partnering with artists around town looking for exposure. Bennett said it’s especially important for artists in Los Angeles to find alternative methods of showcasing their work because it’s harder to draw foot traffic into a gallery than it is in New York, where he owned a gallery before moving to Los Angeles nearly four years ago. “If we can’t get people to come to art, we have to take the art to them,” Bennett said. Know Contemporary, which launched earlier this year, has showcased pieces by Bennett and other artists at six different properties in Los Angeles County so far. The homes have ranged in price from $3 million to $23 million. The company also offers consulting services to art collectors. Bennett promotes the listing parties at the homes via social media and to previous clients. “A lot of them are much more inclined to come out and have a night in the hills, or wherever it might be, than they are in a traditional gallery environment,” he said. While Bennett has yet to sell all of the art staged in a home in one sweep, he said he sold three pieces for more than $80,000 in total to a pair of collectors who saw his work at an open house in Venice. The collectors were interested in buying the home but ended up purchasing the artwork instead. The agency charges a rental fee for the use of the works in the staging, a fee that is replaced by a bonus if the home sells. If the artwork sells, the agent or developer reduces the rental fee accordingly. Christina Craemer, an L.A. artist, architect, and interior designer, partnered with West Hollywood furniture showroom Minotti in 2015 to stage homes with art she curates. While she includes some of her own pieces, Craemer also sources artwork from Culver City’s FP Contemporary, which represents her work, as well as Timothy Yarger Fine Art Inc. in Beverly Hills. Craemer said she sometimes receives a percentage of the sales these arrangements generate. Craemer said she has sold around a dozen of her works through luxury home stagings, including two pieces she sold for $37,000 that were used to stage a $20 million Beverly Hills property. The exposure available at a high-price home is markedly different than what an artist would get in a galley environment. For instance, Craemer said, Oprah Winfrey recently visited an off-market $43 million home in Beverly Hills that has three of her works on display. The opportunity to showcase work in multimillion-dollar properties is something West Hollywood’s Art Angels Gallery promotes to new artists it represents, said co-owners Jacquelin Napal and Kat Emery, who receive a commission on artworks sold. “It’s a whole other avenue, especially for some emerging artists who may never be seen by some of these people purchasing such high-end homes,” Napal said. Last year, the duo staged a Westside penthouse. Six months later, an art collector who attended the launch event visited the gallery and paid more than $50,000 for five pieces, they said. Napal and Emery said they have showcased pieces in 10 homes ranging in price from roughly $5 million to more than $20 million across Los Angeles. The terms of each deal are different. Sometimes they lend the work to developers for free because of the value of the exposure. In other situations, Art Angels charges a fee based on the length of time the work is used to stage the home. But local artists and gallery owners often can’t fulfill the needs of agents and developers looking to access work from blue-chip artists such as Pablo Picasso or Andy Warhol. For those requests, they’ll often turn to a traditional art staging firm and pay an upfront fee. Many local brokerages, including Mercer Vine, Hilton & Hyland, and Halton Pardee + Partners, turn to West Hollywood art stager Creative Art Partners, which specializes in procuring hard-to-find works, according to a spokesman.